Posted without comment | VWXYNot? 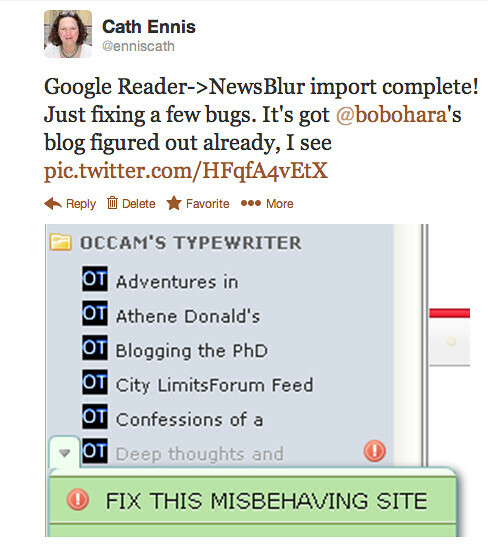 This entry was posted in blog buddies, screenshots, silliness, technology. Bookmark the permalink. Well? have you fixed it yet? I was wondering for a moment who this Bobo Harris was. I’m not switching away from Google Reader yet – I use the Reeder app to access it, and they are promising an alternative before GR dies, so I’m waiting to see what they offer. Sorry – Bobo Hara (I think he was in the second Star Wars film). 😀 Sure it wasn’t an unpublished hobbit based tail tale? I’m rather upset about Google’s decision to kill Reader. Upset enough that Google the cat might get a new name. So, Newsblur looks like the winner right now. It’ll take a bit of getting used to to pay for a service I used to get for free, but it’s only $2 a month and the site just looks and feels “right” to me in a way I can’t define, but really like! oh, and the free NewsBlur app is also better than the mobile app I was using before.